100 Days ... Above Average Every Day! 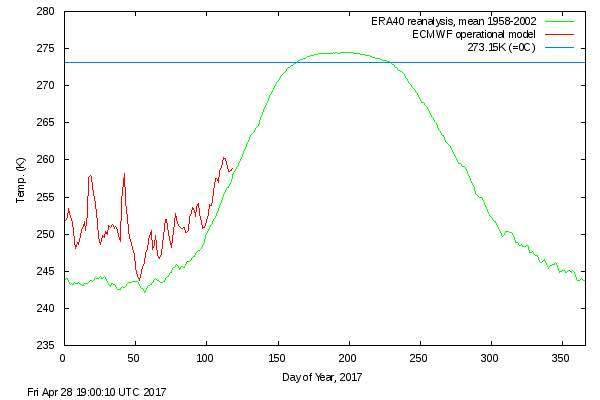 Daily mean temperatures in the Arctic, that is. 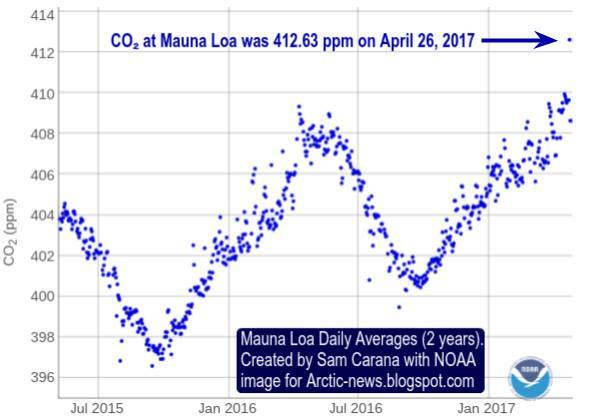 New record daily CO2 observation at Mauna Loa per NOAA!!! 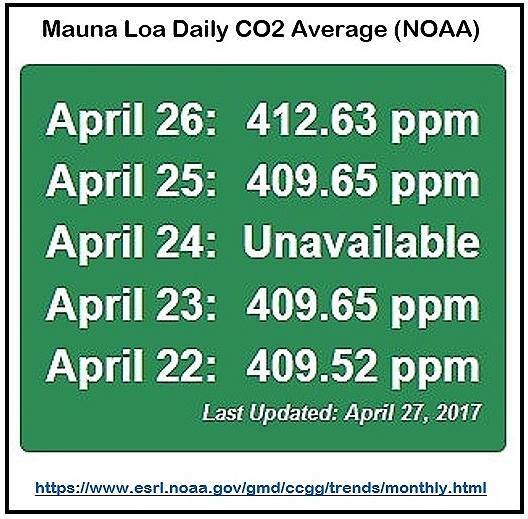 412.63 ppm. 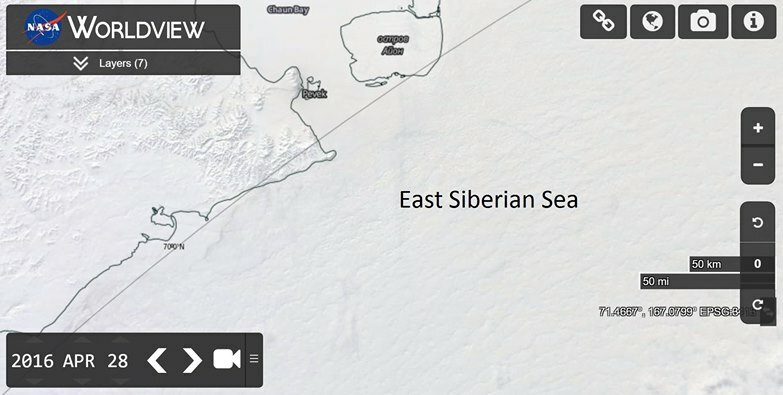 Great 9 minutes of education on the consequences of the loss of sea ice and the subsequent release of methane. 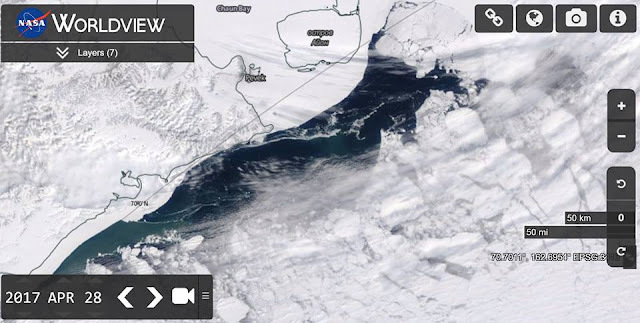 Cameos from Stuart Simpson who describes the Arctic sea ice as decaying exponentially, and that it could be gone as soon as this year and Peter Wadhams who doesn't believe that industrial civilisation can survive a 50 gigatonne discharge of methane. Both are members of the Arctic Methane Emergency Group). That 50 gigs equates to 10 times the amount of methane in the atmosphere than today,that would effectively double the atmospheric burden of carbon! Try and get your head around that this Northern Hemisphere Summer? The thermostat is broken folks. It will runaway in an exponential, non linear way. WARNING! Polar Ice Caps Melting Rapidly | Ice Free Arctic By Next Year! Since the year 2000 we have had 16 of the 17 warmest years ever recorded, with 2016 being the warmest yet. As March almost ends it becomes clear that the ice caps are not the same as they once used to be. They are shrinking dramatically fast and are not following a linear equation anymore, but rather an exponential one. It is predicted that on the current course we could have an ice free arctic by as soon as the summer of 2017, and 2020 at the LATEST. This is a very bad situation, as the polar caps act as the earth's air conditioners and help to keep the planet cool. Also underneath the frozen Arctic lies a massive methane reserve, which if released by the melting permafrost will release enough methane into the atmosphere to kill all life on earth and render it inhospitable. Will the human race wake up to the imminent threat in time or will we continue to be blind and ignorant until it's too late? I used to read everything George Monbiot wrote but after he embraced nuclear power days after the Fukushima catastrophe and then disavowed Peak Oil, proving he never understood it, I have gone right off him. Now he writes (mostly) the same tosh that the Guardian publisises. The always incisive people at Media Lens have just done an excellent job exposing the most recent media campaign for a NATO invasion of Syria as the dangerous, sub-intelligent nonsense it is. 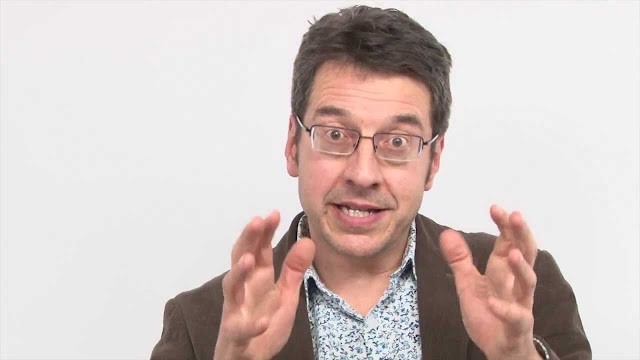 The particular focus of Media Lens’ recent piece – “An Impeachable Offence” is – deservedly – the prize nincompoop George Monbiot, who shall forever be remembered for declaiming in a cringeworthy tweet “Do those who still insist Syrian govt didn’t drop chemical weapons have any idea how much evidence they are denying?” – and then linking to a Medium article citing Eliot Higgins, aka “Brown Moses”, ex-admin for an underwear firm, as the source of incontrovertible proof! Do those who still insist Syrian govt didn't drop chemical weapons have any idea how much evidence they are denying? There’s no excuse for anyone of Monbiot’s public stature giving credit to the entirely discredited Higgins, whose work has been repeatedly debunked. He’s – at best – an ungifted amateur with no training and little ability, promoted by the media and government intel agencies in need of a willing patsy to push stupid claims they don’t want to author directly. Even the full backing of the Establishment can’t conceal his ineptness, which continues to be manifest every time he releases another “analysis.” His bungling attempts to use the free photo analytic programme Foto Forensics to “prove” his claims of Russian fakery were heavily criticised and described as “how not to do image analysis” by the creator of the programme. Higgins himself doesn’t allow any such reality-based critiques to get him down. He lives happily in the media bubble created for him and believes his own nonsense. When Theodore Postol, professor emeritus of science, technology, and national-security policy at the Massachusetts Institute of Technology, challenged the claim that the Assad government had perpetrated the chemical attack on Ghouta in 2013, Higgins, unemployed office admin, apparently dismissed the criticisms as “amateurish”. Perhaps ultimately he can’t be blamed for such extremes of narcissistic delusion, but those – like Monbiot – who persist in quoting him and using his MS Paint-based “analyses” as an argument for a very dangerous war, have no such excuse. Postol issued a very damning analysis of the recent White House claim regarding the alleged sarin attack in Idlib. As with the Ghouta incident it so closely resembles, Postol points up the numerous flaws and failures of the official position that rules Assad’s guilt beyond doubt. ‘Giraldi’ and ‘Syria’ = 0 hits. Is there any better evidence that our press is not free and what we see in our feeds and on our TVs is not “news” but absolute uniform and state-generated propaganda? Portland Rose Parade Cancelled Amid Violent Threats From Anti-Fa: "You've Seen How Much Power We Have... Police Can't Stop Us"
The latest example of a society on the brink of civil war comes to us from Portland, Oregon, where every year the 82nd Avenue of Roses Business Association kicks of the city’s annual Rose Festival with a family-friendly parade. The email said that 200 people would “rush into the parade” and “drag and push” those marching with the Republican Party. “We will not give one inch to groups who espouse hatred toward LGBT, immigrants, people of color or others,” it said. Yes, we seemed to have lost today. The alt-right held their ground. If we wanna take action against them, we need to be better organized and better trained. It doesn’t help that it’s only the far left opposing them, any trump supporter can be radicalized far easier than any liberal. A shocking number of our comrades went in there with absolute no combat training. We need to set up seminars or something of the sort. 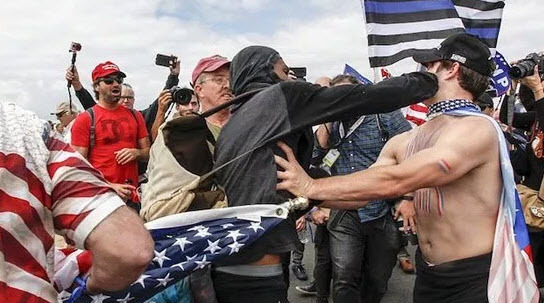 While these folks may think silencing the free speech of political ideologies contrary to theirs through violence is a means to a worthy end, it was the Bolshevik ideology, similar to what we’re seeing from “comrades” in the anti-fascist movement, that eventually gave way to one of the world’s most brutal dictators and was responsible for the deaths of, quite literally, over 100 million people in the 20th century. On another and perhaps equally interesting note, we’ll mention the fact that for years the Department of Homeland Security and domestic law enforcement agencies had warned Americans that it was lone wolves with conservative values who stockpiled guns, food, bibles and peacefully protested government overreach who were, by officials and congressional members, deemed terrorists. We wonder if similar classifications will be assigned to those who threaten families and children at parades? 9 DPR residents were injured this week due to shelling by Ukrainian officials and explosions, set up by the operatives. It was announced yesterday by the Republic spokesman Eduard Basurin. Just in the last 24 hours Ukrainian army fired over 50 times. Aleksandr Bilibov is reporting with details from Donbass. Buoyed by a total of 18 speculative verb forms - five “mays,” eight “woulds” and five “coulds” - New York Times reporters David E. Sanger and William J. Broad (4/24/17) painted a dire picture of a Trump administration forced to react to the growing and impending doom of North Korea nuclear weapons. Behind the Trump administration’s sudden urgency in dealing with the North Korean nuclear crisis lies a stark calculus: A growing body of expert studies and classified intelligence reports that conclude the country is capable of producing a nuclear bomb every six or seven weeks. 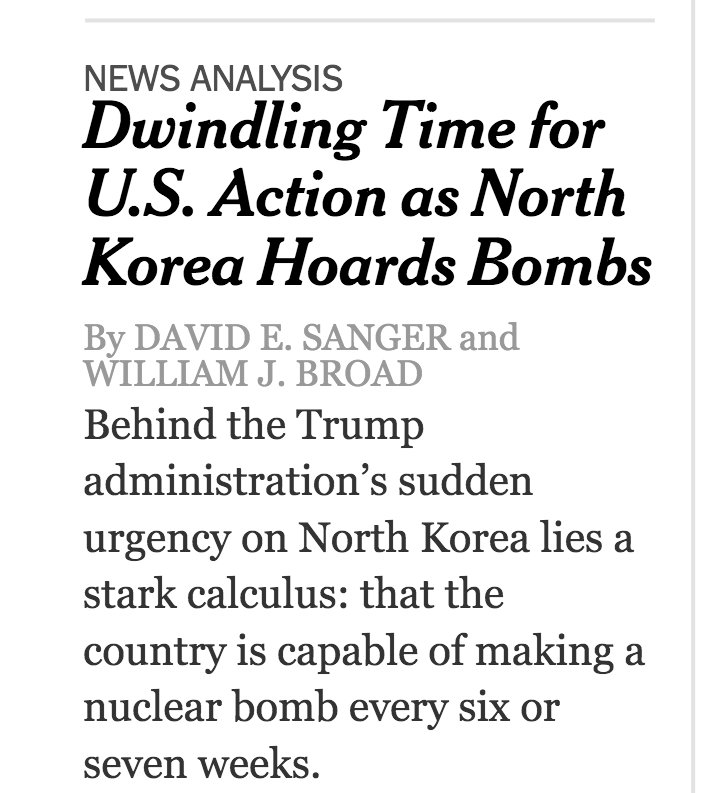 That acceleration in pace—impossible to verify until experts get beyond the limited access to North Korean facilities that ended years ago—explains why President Trump and his aides fear they are running out of time. 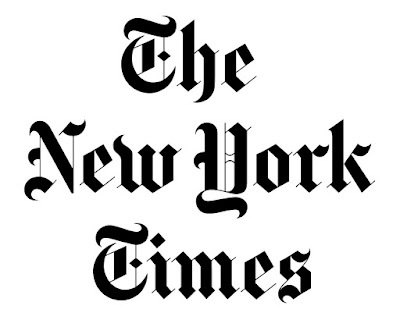 From the beginning, the Times frames any potential bombing by Trump as the product of a “stark calculus” coldly and objectively arrived at by a “growing body of expert[s].” The idea that elements within the US intelligence community may actually desire a war—or at least limited airstrikes—and thus may have an interest in presenting conflict as inevitable, is never addressed, much less accounted for. The most spectacular claim—that North Korea is, at present, “capable of producing a nuclear bomb every six or seven weeks”—is backed up entirely by an anonymous blob of “expert studies and classified intelligence reports.” To add another red flag, Sanger and Broad qualify it in the very next sentence as a figure that is “impossible to verify.” Which is another way of saying it’s an unverified claim. When asked on Twitter if he could say who, specifically, in the US government is providing this figure, Broad did not immediately respond. Unless something changes, North Korea’s arsenal may well hit 50 weapons by the end of Mr. Trump’s term, about half the size of Pakistan’s. American officials say the North already knows how to shrink those weapons so they can fit atop one of its short- to medium-range missiles — putting South Korea and Japan, and the thousands of American troops deployed in those two nations, within range. At any moment, Dr. Hecker said on a call to reporters organized by the Union of Concerned Scientists, a live weapon could turn into an accidental nuclear detonation or some other catastrophe. Hecker and other semi-neutral observers (Hecker worked for the Department of Defense for several years) are understandably worried about more nuclear weapons in the aggregate, especially in the hands of a relatively poor country with a long history of botched missile attempts. But who, exactly, is making the article’s most alarmist predictions? It’s unclear. Here is the most frightening thing you’ll read all day: Growing numbers of US intelligence officials believe North Korea can produce a new nuclear bomb every six or seven weeks. 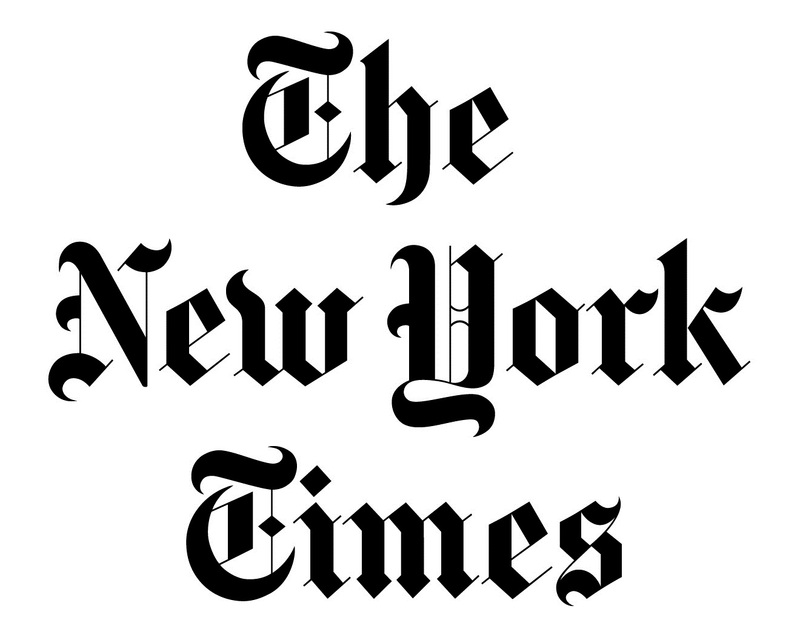 Defense experts estimate that the North is capable of producing a nuclear bomb every six or seven weeks, reports the New York Times. Experts say the country is capable of producing a nuclear bomb every six or seven weeks, the New York Times reported Monday. …amid fears the secretive state can create a nuke every six weeks. But from whence did this meme come? Who, exactly, made this claim? Is there any dissent within the community of “experts” on this prediction? Is there an official document somewhere with people’s names on it who can later be held accountable if it turns out to be bogus? Once again, the essential antecedents of war are being established based on anonymous “experts” and “officials,” and hardly anyone notices, much less pushes back. Did Russia shoot down North Korean missile? Zhirinovsky - war? Bring it on! Is war in Korea postponed? You need to pay attention this Wednesday!